Many American cities have struggled with the recent news that Bearmageddon is coming and the rise in bear attacks is only a light preview of the carnage that is in store for us all. Some have fled, others have put up walls, but the town of Slone, WA has takes a unique approach. 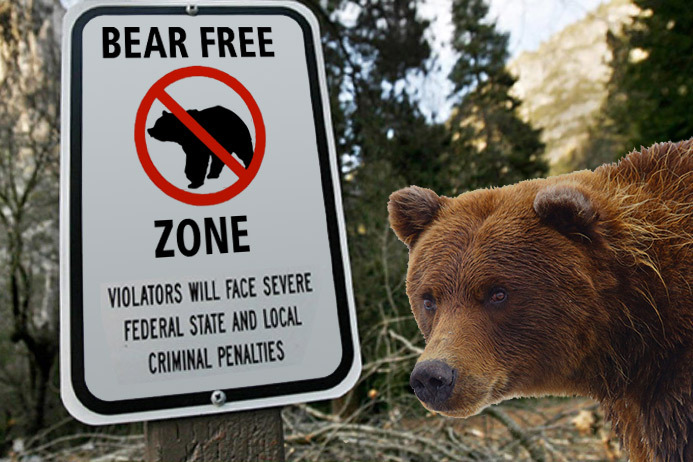 They posted a sign at the city entrance declaring their territory a “bear free zone”. When asked if they thought bears would obey such a sign, Slone mayor Juliana Kurtz had this to say: “Yes”. Time will tell if the signs are effective. UPDATE: Nope. A memorial service for the entire town of Slone will be announced on Wednesday. Unfortunately, Max the meanest bear in the forest heard about the Bear Free Zone and seek out the person who posted the sign and devoured him and his whole family. Then seek out the mayor and did same. When the people of town heard what’s happened they immediately left their homes never to return. Max scratched through the FREE on the sign making it a Bear Zone area.